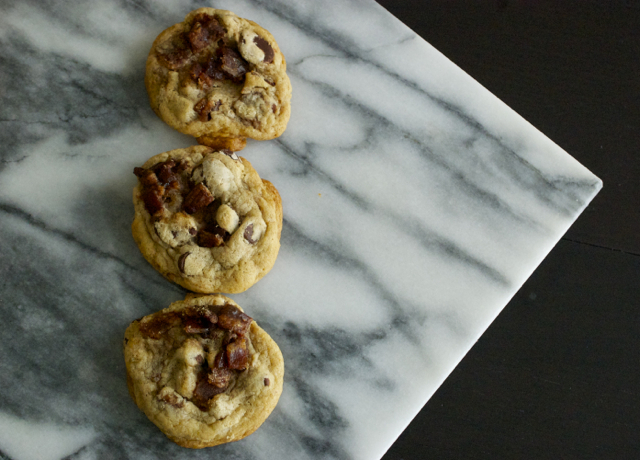 A while back, we found the perfect chewy chocolate chip cookies at Sally’s Baking Addiction. When we say perfect, we mean perfect! We tried multiple things to make them even better, all to no avail… until we remembered the one thing that makes everything better… BACON! This salty-sweet pairing totally works, and believe us, this is not your average bacon. We coated it in brown sugar and baked it to create a perfectly crisp and sweet candied bacon… the bacon gets all caramelized… and candied… and wonderful. Ingredients: 1/2 cup packed light brown sugar, 1 teaspoon ground cinnamon, and 12 slices center-cut bacon (don’t use extra-thick bacon). Directions: Preheat the oven to 350°F. Line a rimmed baking sheet with foil and set a rack on top (like a cookie cooling rack or a broiler pan). Spray the rack with nonstick spray. Mix the sugar and cinnamon in a bowl. Dip bacon slices in the cinnamon-sugar, coating both sides, and place the coated bacon strips on the rack. Bake 15 to 20 minutes, or until the bacon appears to be caramelized and somewhat crispy. Since the sugar can begin to burn when left in too long watch closely after the 15 minute mark. Besides the addition of candied bacon, we also swapped a little of the melted butter for melted bacon grease. If you don’t have any reserved bacon grease on hand make sure you fry or bake up some plain bacon to get a few tablespoons worth. 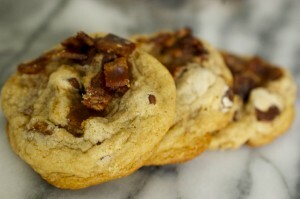 Don’t try to use the grease from the candied bacon because the sugar content will affect the recipe. Also, if the idea of using bacon grease is not for you, feel free to do an even swap for butter in this recipe… but who are you kidding, use the bacon grease! In a large bowl, whisk together the flour, baking soda, cornstarch and salt. Set aside. In a microwave safe bowl, or a sauce pan, melt the butter and bacon grease until combined. Set aside. In a medium bowl, whisk the melted butter mixture, brown sugar, and white sugar together until no sugar lumps remain. Whisk in the egg, egg yolk, and vanilla extract. 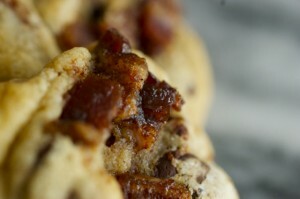 Fold in the chocolate chips and half of the candied bacon. When ready to bake, take the dough out of the refrigerator and allow to slightly soften at room temperature. Preheat the oven to 325°F and line two large baking sheets with parchment paper. Roll a heaping 2 tablespoons of dough. Once rolled, pinch the dough into a column to ensure the cookies will bake up thick. Press a few more chocolate chips and/or caddied bacon on top, if desired. Bake the cookies for 11-12 minutes. The cookies will look very soft and under-baked, but will continue to bake once out of the oven. Allow to cool on the cookie sheet for about 10 minutes before moving them to a wire rack to finish cooling. Rolled cookie dough can be frozen up to three months in an airtight container and baked while still frozen for 12 minutes at 325°F. Note/Update: Do not use an electric mixer for these! I made the mistake of using my stand mixer since my daughter doesn’t think we’ve baked unless we use the mixer. They turned out flat, flat, flat! Still delicious… just not thick and therefore a little less chewy.